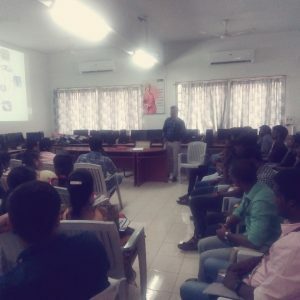 Industrial lecture was delivered to students on the topic of “APPLICATIONS OF IoT IN CIVIL ENGINEERING” on 06.2.19. The talk was arranged for Second year Civil (UG) and M.E Structural engineering students in Seminar Hall/Civil Department, from 10.00 A.M-11.00 A.M. The resource person for the guest lecture was Mr. Selvaprasanth P, Assistant Professor, SNS college of Technology, Coimbatore. Around 50 students attended the lecture along with 02 staff members. The workshop is started with introduction of Chief Guest by Dr.Gulshan Taj, Associate Professor/Civil. At the initial talk, main focus is given on Introduction to Internet of things and the four pillars of IoT. In order to kindle the curiosity among the students introduction is started with the mind mapping and thereon students find interesting to learn more about IoT. Different software and hardware components required for IoT is explained with pictures and vedios. Different sensors that can be deployed for the measurement of strain, temperature, pressure, gas, smoke are explained in detail. Different application areas like health monitoring like structures and bridges, smart car parking, smart mix design were discussed with practical examples. Further scope of Civil Engineers is narrated and explained the importance of interdisciplinary research in the future construction industry. Few demonstration vedios about health monitoring of bridges are shown which found to be very interesting to further explore to emerging concepts like IoT. 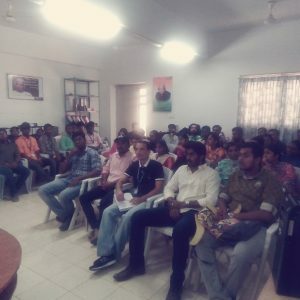 A student report on the talk stated that “Since the lecture given thrown more emphasis on interdisciplinary knowledge among Civil and Computer Engineering, scope of job opportunities for Civil Engineers can also be widen in IT domain”. This entry was posted in Civil Events on February 6, 2019 by Sona Civil Department.